The One&Only Royal Mirage Residence is nothing short of paradise. Set amongst 65 acres of lush manicured lawns and fringed with bowing palm trees, the Arabian inspired resort evokes feelings of majesty and decadence. A short 30 minute drive from the airport will bring you to the Royal Mirage Residence. Situated between arid deserts, topaz waters and a bustling metropolis it is perfect for families who enjoy day excursions and for couples who want to repose in bliss. Opt for a luxurious massage at the One&Only spa, head to the putting green for a round of golf or explore the magnificent city of Dubai before finishing the day at the hotel’s exquisite restaurant. This immaculate resort is comprised of 48 rooms and suites, all of which offer uncompromised luxury. Choose to stay in the Residence Prestige Room for impressive views of the Arabian Gulf. Large French doors open onto immaculate gardens, where you can stand back and admire the stunning views from your private balcony or terrace. 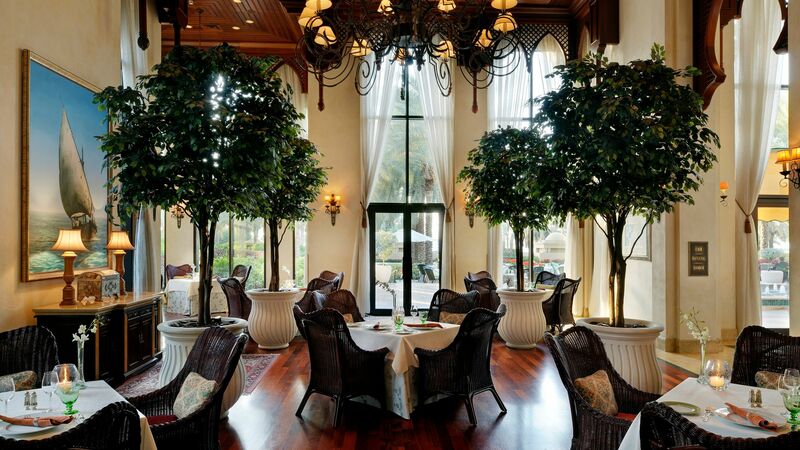 Decorated with intimacy and opulence in mind, The Dining Room is the perfect setting for a romantic meal for two. Open for breakfast, lunch and dinner, an array of authentic and international dishes are available. Each is comprised of only the freshest ingredients. Open: 06:30 - 11:30, 12:00 – 15:30 and 19:00 – 23:30. The dress code for this restaurant is Casual Elegance. Sleeveless t-shirts, shorts and flip flops are not permitted. Unwind with a digestif in The Library Lounge. A menu of alcoholic and non-alcoholic drinks is available. Find yourself tempted by the impressive cocktail list for an ideal way to spend the rest of your evening. 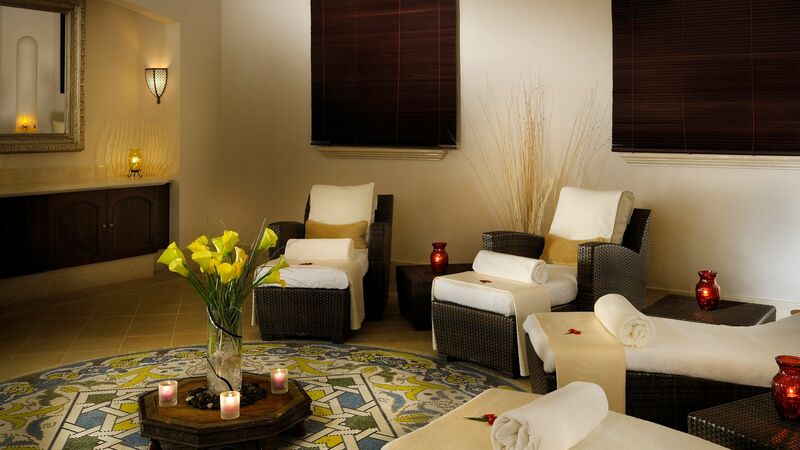 Relax and indulge with a pampering at the luxurious One&Only Spa. Expert masseuses will tailor treatments to suit your needs, ensuring full relaxation of your mind, body and soul. The traditional Hammam offers an oasis of tranquillity and rejuvenation. Spend your morning here for an authentic steam bath experience and choose from a number of traditional treatments and massages to achieve incomparable relaxation. One&Only have a fully equipped fitness centre for you to use at your leisure. With tennis, volleyball and basketball courts free to use, as well as a putting green, there are a number of ways to keep active on your trip. For those who are a little more adventurous, opt for a day of water sports. A variety are available at the One&Only Royal Mirage Residence. The One&Only Royal Mirage Residence can be found nestled along Dubai’s golden Jumeirah Beach shoreline. It’s within easy reach of the city centre via the monorail, where you can enjoy a huge range of activities, from aquariums and water parks to shopping, ice skating and even skiing. Spend your days on the beach or book excursions into the desert, city or Arabian Gulf. In the evenings, there are some fantastic bars and restaurants to choose from. Enjoy Michelin starred menus before watching the city lights from a rooftop bar, cocktail in hand. Residence Junior Suites measure 85m² and feature an impressive king size bed on a raised platform leading down to a living area with a dining table and 'Majlis' style seating, bathroom with a bathtub and a separate shower. Residence Prestige Rooms measure 58m² and offer wonderful views over the scented gardens, the pool and the Arabian Gulf beyond. Decorated in a traditional Oriental style the rooms feature a king size bed, bathroom with a bathtub and a separate shower, balcony or terrace, WiFi, satellite TV and safe. This was our 5th stay at this superbly resourced hotel so I guess that says just how highly we rate it and more importantly the people from top to bottom. 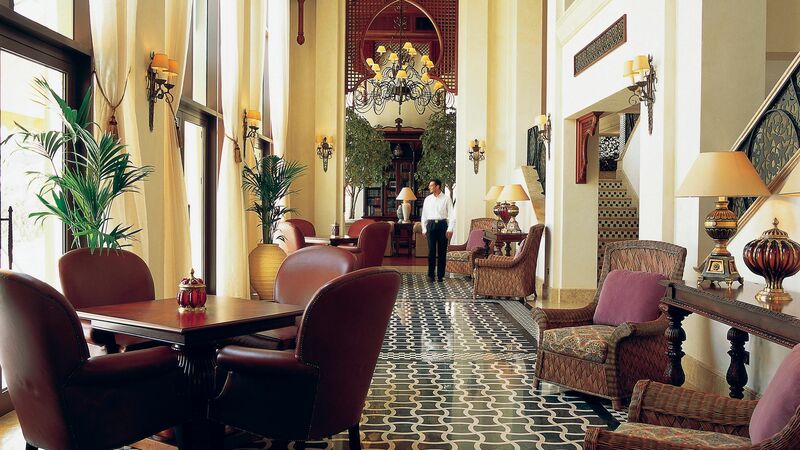 Whilst the GM, Mr Hicham Mchater is highly approachable and operates the hotel in a relaxed manner, befitting of it?? ?s location, it is all based on efficiency and respect fir the guests. Nothing seems too much trouble! Guests can use all the facilities including the restaurants at the neighbouring Arabian Court and Palace Hotels which are top class in their own right but if you want to feel particularly looked after, stay at The Residence & Spa. Of course we have our favourite members of staff but everybody is so attentive and obliging, within reason! Here?? ?s to our next stay.